TheStreet talks with ex-hedge fund billionaire and current cryptocurrency investor Mike Novogratz about institutional investment in crypto, his big bet on EOS and the advantages of security tokens at Korea Blockchain Week in Seoul. The institutions are coming for crypto. At least that's according to one-time hedge fund billionaire Mike Novogratz. 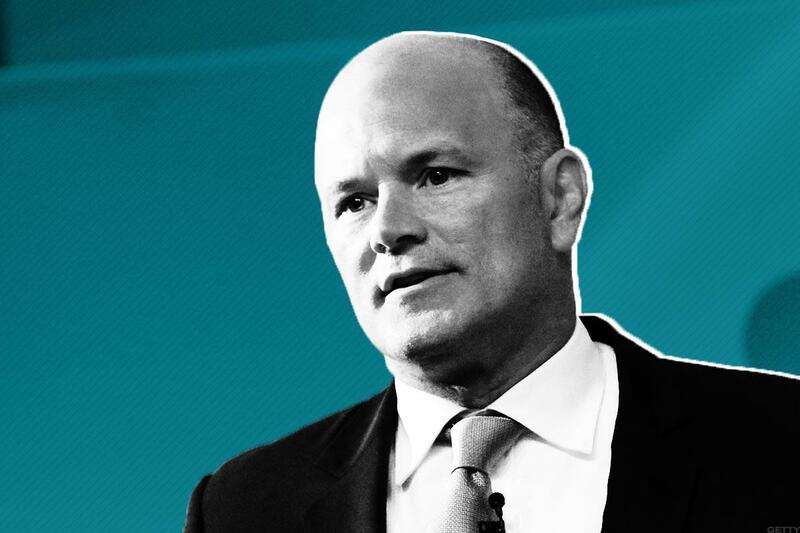 Novogratz previously led a notable macro investment fund at Fortress Investment Group, where he oversaw close to $9 billion in fund assets and was estimated to have a personal fortune of $2.3 billion. But a poorly-timed bet on Brazilian assets in 2015 right after taking a losing position in a Swiss Franc versus Euro currency trade caused Novogratz's temporary retirement and the closure of his fund. The voluble Novogratz has since staged a comeback on the back of a $250 million gain on cryptocurrency, Ether, in 2017. He's now put about 10% of his own wealth into Bitcoin, Ether and other cryptocurrencies. Earlier this year, he raised $250 million to launch a merchant bank, Galaxy, to trade cryptocurrencies and make principal investments into blockchain companies that issue those assets. He's also recently made big bets on the cryptocurrency EOS and its smart-contracts platform, EOS.IO. In a keynote speech at Blockchain Week Korea this past week, Novogratz said that a "herd of institutional investors" is headed towards cryptocurrencies. TheStreet caught up with Novogratz in a press conference that followed his talk and also for some one-on-one time right after. TheStreet: You've said that institutional investors will "inevitably" take part in ICOs. Why? What is the current thinking among institutional investors? Mike Novogratz: I think institutional investors are slowly coming to the realization that blockchain will be Internet or Web 3.0 and they'll want to participate just like they want to participate in the Web. Their first way of participating is going to be through venture-capital funds. Many of them are already participating because they've invested in Sequoia or Polychain or Benchmark or many of the other VC funds that invest in this area. The second step for them will be buying the coins and/or the ICOs themselves, but many of them are participating in the ICOs already through their venture investments. Some of venture capitalists who were original investors in the cryptocurrency market -- like Marc Andreessen and Fred Wilson -- were very early but most did not participate so much. Funds like MetaStable, Pantera and Polychain got set up to invest in these projects; it's like ourselves with Galaxy. Now, all of the venture capitalists are also investing -- including SoftBank (SFTBY , SBI in Tokyo and many funds in Hong Kong. And so there's a lot more competition for good projects. Novogratz is a big believer in EOS. TheStreet: You've analogized blockchain technology as being "like the back of a television." Can you elaborate? Mike Novogratz: Most consumer users don't really care how [money] wires get transferred around the world. When you go to the bank -- understanding how a bank sends money from one bank to another -- is not something that retail consumers bother with. Like the television, you turn on a television and you watch it. It just works. You don't really care about the wiring behind it and I think the blockchain, on the architectural level, is an infrastructure that most people won't bother with, once it's running properly. TheStreet: You're the biggest participant in cryptocurrency EOS. What do you feel is the strength of that ecosystem? Mike Novogratz: The EOS ecosystem is built on a blockchain that's called the "delegated proof of stake." And so, instead of having many, many staking agents, they pick twenty. And because it's just twenty and those twenty have big computing power behind them, the EOS blockchain will be much, much, much faster than the other blockchains. It's already doing 5,000 transactions a second. It should be doing 50,000 transactions per second in a few months. EOS is the first blockchain where commercial applications can be built and experimented with. Lots of people find that very appealing. EOS's critics say it's not decentralized enough and that's a very fair debate, back and forth, that you can participate in. I believe that there will be markets for many different blockchains. We'll see over the next three, perhaps four to five, years which blockchains that other projects want to build on and which ones consumers value and place their trust in. TheStreet: You've supported the introduction of security tokens as a breakthrough in asset liquidity. You've also said you don't expect to see the volatility in security tokens that we've seen in other cryptocurrencies. Why? Mike Novogratz: With a security token you're just buying a percentage of revenue and a percentage of profits in a company. It will feel a lot like equity. Some of the securities tokens that are securing a fund or securing a bunch of real estate will trade with the underlying volatility and excitement [about] those assets. So if you are a fund and the fund does 13% or 14% per year, you're up 13% to 14% a year. Security token price action contrasts with why most people got into crypto, [which is] buying something at $1 and hoping it goes to $1,000. You're not going to see that with most security tokens. Can Bitcoin and Other Cryptocurrencies Rebound in the Second Half of 2018? Now, there will be some new companies set up, where -- yes, there will be some Googles of the world that will grow. Like Amazon or Google equities, if they issue a security token instead of equity, you'll still have that kind of several magnitude price increase. But I think the lion's share of security tokens will not see that level of appreciation. Why would you use a security token versus equity? Because you're going to secure something that wasn't available with equity. So if it's taking a piece of art and fractionalizing it, it will trade with the volatility of the art market, which is still volatile but it's not nearly as high as what we are used to with crypto. TheStreet: Mike, thanks for your time. Mike Novogratz: My pleasure -- I support TheStreet's solid coverage of blockchain and cryptocurrencies.